Many theories exist about crystal skulls. No one seems to know exactly how many exist and who made them, deciphering this mystery is complicated even more by the fact that most skulls nowadays are made by human hands. Some Mayan tribes who are still alive in Central-America say that their people are responsible for the creation of the 13 'genuine' skulls, and that every 1,000 years one is made, in which all collected knowledge of the previous period has been stored. The spirits of the skulls will soon be ceremonially awakened by the current Mayan Elders. Through this, the stored knowledge will be added to our collective consciousness, resulting in a big human awakening. Other sources state that the high priests of Atlantis foresaw their fall more than 10,000 years ago and for that reason stored all their knowledge in a number of skulls which were scattered here and there over the Earth. At the end of the next universal cycle (just about now) these skulls would reveal their knowledge again. Most sources however, among which are channeled entities (1), say that the original 13 skulls were created by extraterrestrial beings. Reportedly, they were formed as the prototype of the perfect human consciousness. After the foundation of Lemuria, some 900,000 years ago, these skulls were left on Earth so that primitive man could develop accordingly. There is more or less consensus about the fact that now 8 of the 13 original skulls have been found. One of the most well-known and heaviest of these skulls is called "Max" which was found around 1925 in a Mayan tomb in Guatemala. 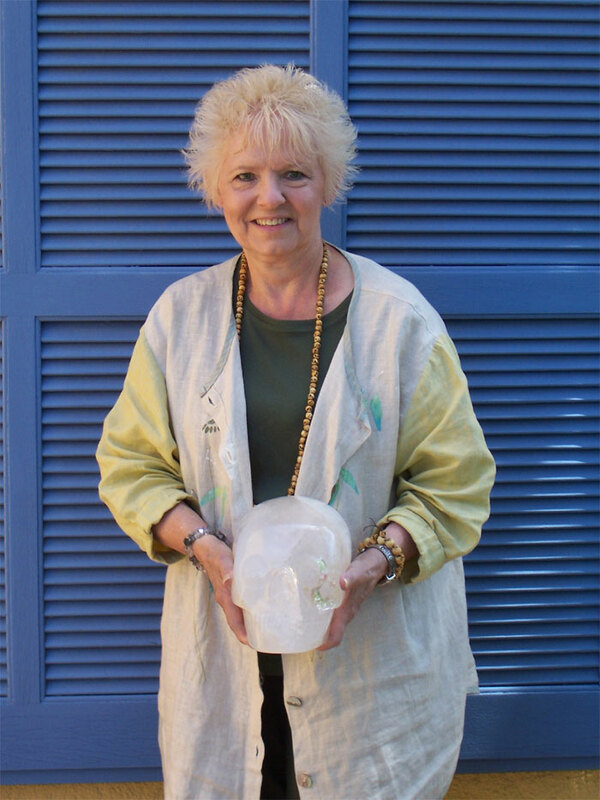 Through Mayan priests and the Tibetan healer Norbu Chen it came into the possession of JoAnn Parks (2) who now travels around the world with it (3). Max can connect telepathically with whomever is interested and played a role, by its own testimony, in the Mayan and Atlantis civilizations. This skull is one of the few original skulls that is accessible to the public, the rest are behind glass in various museums or in private collections. A Dutch woman called Joke van Dieten for instance is the owner of an apparently original skull called "ET" (4). 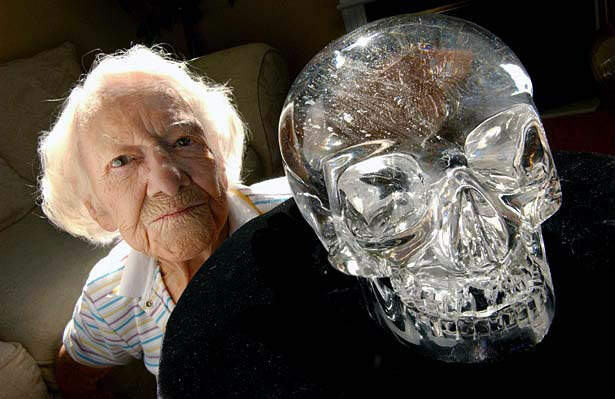 Another well-known crystal skull is the Mitchell-Hedges Skull which has a similar story. It was discovered in 1924 under an altar in the ancient Mayan city of Lubaantun in Belize. Seventeen year old Anna Mitchell-Hedges found it. She was the daughter of the British explorer Frederick A. Mitchell-Hedges who took her with him on one of his travels. A Mayan priest told them that the skull had magical powers. They took it with them and it remained in Anna's possession until her death in 2007. In 2002, she married the much younger American, Bill Homann, who inherited the skull from her and by request makes it available to the public and researchers (5). As with the skull "Max", psychics have connected with it and have received all kinds of information and images from the past. Another striking feature is that the orbits act as prisms and the entire skull lights up when a lamp is shined on it. In the late 60s, the skull was examined by the Hewlett-Packard technology company in their laboratory where they test crystals for their computers. They couldn't find any traces of tool markings, but discovered all sorts of amazing properties when lights or lasers were shined on the skull. They confirmed that both the top and the loose lower jaw were made from one and the same piece of quartz crystal. In their estimation it would take at least 300 man-years to create such thing (6). Left: explorer F.A. 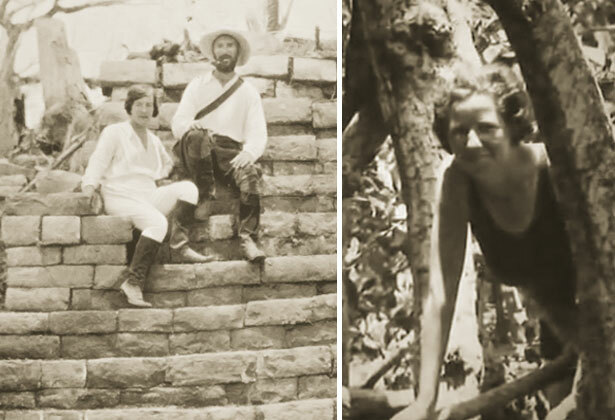 Mitchell-Hedges and his girlfriend and financier Lady Richmond Brown during an expedition in Central America in the 20s. Right: the young Anna Mitchell-Hedges came along too. 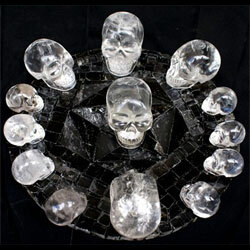 Whatever the exact story behind the crystal skulls may be, it's a fact that many skulls are created with such a sophisticated technique that to this day they cannot be replicated. Especially baffling to modern scientists is the loose lower jaw of some skulls that like the rest of the skull is created from one piece of crystal without breaking in the process. Recently, modern scientists confirmed that quartz crystal is an excellent material for storing computer data almost indefinitely (7). (7) 5D Crystals Can Store Data Virtually Forever, Scientists Say.